So, you have the cot, the pram, the cradle, and all the other main items that you will need for your new arrival. Now, it's time to think about the bedding side of things. There are many different types of bedding and blankets available and sometimes it can be confusing as to what you actual need or what each is for. Below is a quick guide that will point you in the right direction when searching for baby bedding. 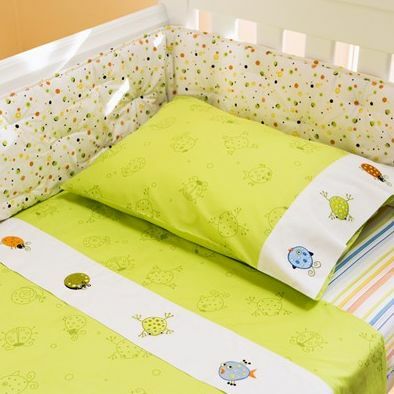 Cot Sheet: Designed to line the cot, these cot sheets come in various sizes, colors and materials. You can also choose from having fitted baby cot sheets or flat sheets. A fitted sheet won't ruffle and come away from the mattress but can be difficult to fit if the mattress is stiff and heavy. Flat sheets are often used as a top sheet along with a blanket. They can be used on the bottom also, but tend to move around as your baby moves. Flanlette cot sheets are a popular option for flat sheets as are very soft, whereas cotton is the preferred material for fitted sheets as they can be washed at high temperatures and don't require ironing. Cot Bumper: Cot bumpers are soft pads that are attached to the sides of the cot and are designed to give babies extra protection from the hard sides. However, the safety aspect of these features is questionable as they may be linked to Sudden Infant Death Syndrome (SIDS), so please carry out your own research before purchasing. Bassinet Sheet: These come in fitted or flat baby cot sheets styles and many will also double up to fit in a pram when sitting flat. They tend to be made of cotton as are cool and long lasting, but fleece bassinet sheets are a more popular choice for the winter. Cradle Sheet: Cotton cradle sheets are the most popular choice for parents as they are long lasting, can be washed at high temperatures and don't require you to iron them. Polyester is another material that is quite often used for cradle sheets as they are very soft to touch and are thick and warm too so are great for those cooler evenings. You can even get flannel and velour cot sheets if you are looking for something slightly different. It shouldn't be too hard to find a few suitable options for your newborn baby. There are lots of great deals online for baby cot sets Australia where you can pick up sets for next to nothing. Just remember to buy bedding that will be suitable for all weather, for example a cotton cot sheet for the summer and fleece cot sheet for the winter to help your baby remain happy and healthy.